General Conference of Seventh-day Adventists v. Walter McGill dba Creation Seventh Day Adventist Church, et al. "Now as in former ages, the presentation of a truth that reproves the sins and errors of the times will excite opposition. 'Everyone that doeth evil hateth the light, neither cometh to the light, lest his deeds should be reproved.' John 3:20. As men see that they cannot maintain their position by the Scriptures, many determine to maintain it at all hazards, and with a malicious spirit they assail the character and motives of those who stand in defense of unpopular truth. It is the same policy which has been pursued in all ages. Elijah was declared to be a troubler in Israel, Jeremiah a traitor, Paul a polluter of the temple. From that day to this, those who would be loyal to truth have been denounced as seditious, heretical, or schismatic. Multitudes who are too unbelieving to accept the sure word of prophecy will receive with unquestioning credulity an accusation against those who dare to reprove fashionable sins. This spirit will increase more and more. And the Bible plainly teaches that a time is approaching when the laws of the state will so conflict with the law of God that whosoever would obey all the divine precepts must brave reproach and punishment as an evildoer." The Great Controversy, pp. 458, 459. Pastor A. T. Jones, 1895 General Conference Bulletin, page 28. Update 06/16/08: An order granting in part and denying in part [pdf doc] the General Conference's motion for a summary judgment was issued on June 11, 2008. 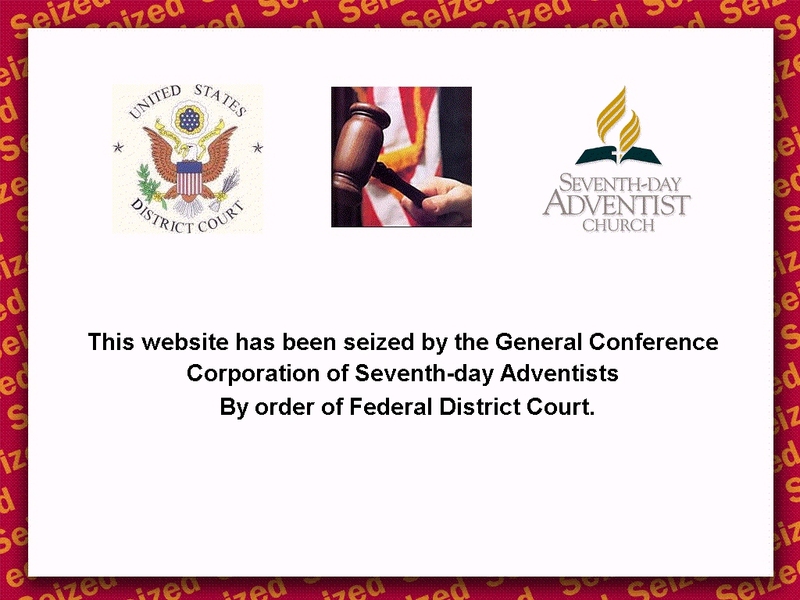 The trademarked name "Seventh day Adventist" was upheld by the judge's decision. A complete victory was denied the Conference, however, regarding the words "SDA and "Adventist." As more information about what this decision means for the CSDA movement becomes available, we will update this page. Update May 27, 2009: The District Court Judge has issued a permanent injunction including sanctions against the Defendants. June 17, 2009 was the last day of grace for certifying compliance with the order. Update January 6, 2010: Judge Breen adopts the Magistrate judge's recommendation in full and issues an order of contempt against Pastor McGill. The order also authorizes the seizure of several websites suspected of association with or ownership by the CSDA Church, including some not violative of the injunction. February 12, 2010, the General Conference attorneys, accompanied by a Federal Marshal and the Defendant's attorney are to raid the Guys, TN church house, taking down the CSDA Church signs and disposing of all other offending articles. Update 03/22/06: The General Conference attorneys have now sent documents to our web-hosting company complaining of certain trademark violations among our domain names. As documentation becomes available we plan to post for your reading. Update 09/02/06: We have received the decision of the arbitration panel appointed by WIPO. The decision of the panel is that all four of the domain names under dispute must be turned over to the Conference. This will be done automatically at some point in the near future; therefore, we are in the process of updating our current site (csda.us) to house all of our relevant data. We are anticipating that local litigation may follow at any time, therefore we ask for the continued prayers and support of those who protest any and all unions of civil power with ecclesiastical authority. The decision documents that pertain to our case may be read HERE and HERE. The official online WIPO decision may be accessed HERE. Update 09/27/06: The SDA trademark lawsuit expected for the past 15 years has now begun. The "image of the beast" is imposing "the mark" on the "Remnant Church of Creation 7th Day Adventists." The legal complaint may be viewed by clicking HERE or HERE for printable PDF format. An explanation (in Real Audio) of our reasons for not yielding the name "SEVENTH DAY ADVENTIST" can be accessed HERE. The Canadian website is accessed HERE. Pastor "Chick" will be answering the demand letter in a timely manner. Update 09/04/08: The trial has been moved to an unset date pending a court-mandated mediation conference between Pastor McGill and the Plaintiffs, set for October 2nd. The purpose of the conference is to attempt to reach a comprimise regarding the remaining issues - the acronym "S.D.A." and the name "Adventist." Pastor McGill has certified to the court that he will not be attending the mediation conference. Update 12/14/09: The Magistrate Judge has filed a report and recommendation with the Court advising it to adopt the contempt of court charges requested by the Conference and award them attorney's fees, as well as the confiscation of virtually all domain names related to the CSDA faith, whether making use the name or not. The Magistrate Judge advised against the use of U.S. Marshals, as the GC had requested, and instead advised the Court to order the GC to "see ye to it," taking down the signs either themselves or through their agents, and to present us with the bill. Surely, the sight of the General Conference's agents reaching up to destroy and obscure the name "Seventh Day Adventist" will be of great significance in the eyes of the watching universe.